Kurlansky has drawn all of this together into a solid, interesting book. Unlike two previous books of his that I have read, Cod and Salt, it does not begin to feel rushed towards the end, and this is a good thing because I hate it when non-fiction writers spend 3/4 of the book discussing some aspect or time period in slow motion and then suddenly shift into fifth and rush the ending. 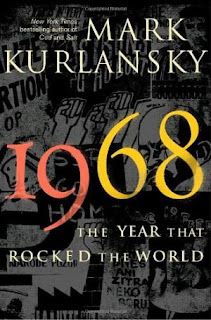 This book continues at the same steady, relatively fast pace all the way through and manages to convey, if not all the history of 1968, then at least a sense of the atmosphere and an overview of important events and people. It is designed more to whet one's appetite for more specifics rather than to be a definitive history of an interesting year. 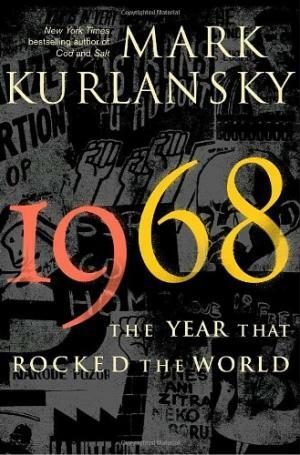 Reams of books have been written about the events of 1968, some wide-ranging and others focusing on one particular country, event or person. A number of them made it into the bibliography, and I will be perusing that to see if I find books about the things that especially interested me in this book. This book is very fact-heavy and I mostly read it while eating breakfast and dinner in my kitchen, so you could say that for the last couple of months I have been digesting it little by little. Unfortunately, trying to read it at bedtime inevitably brought on the yawns after a few pages - not because it is boring, but because it is so packed with names and facts that my brain needed to be fully alert to follow everything that was happening on the page, and not winding down after the day. This is not a fun read, but it is an interesting one. It details some of the many things human beings do to each other in the name of one ideology or another, but also the hope that springs eternal in humans that change can be achieved if they only try hard enough.